Remastered and expanded, with previously unreleased music, this 2-CD deluxe presentation showcases Arnold&rsquo;s score in stellar fashion. Among this re-issue&rsquo;s unreleased treasures are two early song demos performed by the composer. The official title song, performed by Garbage, is also contained in this program. 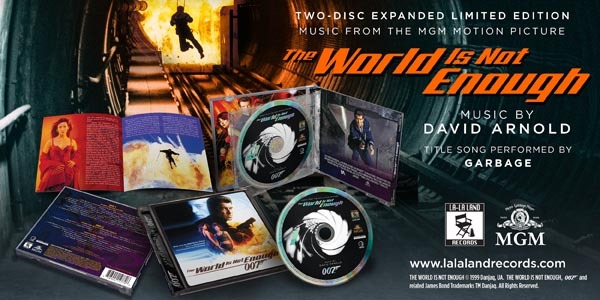 Produced by David Arnold and Neil S. Bulk, and mastered by Doug Schwartz, from original stereo digital tapes provided by MGM, this special release is limited to 5000 units and features exclusive, in-depth liner notes by writer Tim Greiving, which include new comments from the composer and famed Bond lyricist Don Black as well as director Apted. Dan Goldwasser&rsquo;s sharp art design, based on the original US poster for the film, ties up this must-have release in precise and classy fashion.